Like many gifts from the literary universe, my guest blogger today came to me via a mutual online friend. But even before I got the email about the book Message From a Blue Jay, I was already interested in Faye Rapoport DesPres—because she's done what many say cannot be accomplished (and frankly, what I am also trying to do): published an essay collection without first having a slew of traditionally published novels and/or a best-selling memoir to her credit. 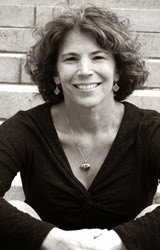 Faye earned an MFA in Creative Writing from the Solstice Creative Writing Program at Pine Manor College, and her essays, fiction, poetry, reviews, and interviews have appeared in many literary journals and magazines, including Ascent, Fourth Genre, Superstition Review, and The Writer's Chronicle. I first learned about the concept of “linked collections” at an AWP panel in Denver in 2010. As a new MFA student enamored with the personal essay form, I had dreams of one day publishing a collection of individual essays. Yet one after another the panelists discussed the difficulty writers face when submitting essay collections to publishers. The current buzzword in the industry was “memoir,” they said, and if your personal essays couldn’t be marketed as a memoir, it was going to be difficult to convince a publisher to take your manuscript. At the time I was approaching each essay I worked on as an individual piece. One essay might be about the loss of a family member and another might describe a trip to London. Taking the advice of a number of my teachers, I was practicing my craft on shorter works before attempting a book-length manuscript. Each essay was an experiment of its own – the length varied from less than 1000 words to 5000 words or even longer. The style changed from lyric to reflective, and sometimes I framed a narrative inside another narrative. I wrote some essays in the present tense, and others in the past tense. I was trying out different forms and tones in an effort to see what felt right to me as a writer, and to find my own voice. I submitted some of the individual pieces to journals and magazines that seemed to match each essay’s content or form, and a number of them were published. I was so focused on making my individual pieces the best they could be that I hadn’t even thought about linking them in any way. Fast-forward to May 2014, and my debut book, Message from a Blue Jay has just been published by Buddhapuss Ink., by a wonderful independent press out of Edison, New Jersey. The book is an essay collection, but it also qualifies as a memoir or a linked collection that forms its own kind of narrative—the story of what I call my “middle decade,” the years between 40 and 50. So how did I transform my individual essays into that elusive cohesive narrative without losing my reverence for the essay form? At first, after I had completed enough pieces to attempt to publish a collection, I found that the panel had been right: a number of publishers liked my work, but their editors felt they couldn’t market an “essay collection.” Some didn’t see how the pieces were linked, or questioned the inclusion of one or two of the essays I’d chosen to be part of the manuscript. One editor, Lynn Vannucci of Water Street Press (a high quality new publisher out of California) liked the writing enough to make a specific suggestion: mine the over-arching themes in the work, and re-order the essays chronologically so that they form more of a memoir with a clearer narrative arc. I didn’t quite go back to the drawing board, but I took that editor’s advice. I thought carefully about what major over-arching themes did link my work and how the book might have a clearer, chronological beginning, middle, and end. The essays were, in fact, as a whole representative of what can happen during a particular time of life. Once I started to re-envision my manuscript in this way, things fell into place pretty quickly. I took out two essays that didn’t add to or fit with the narrative and wrote and added two new pieces that amplified the meaning and added a sense of revelation toward the end. Then I added an introduction that spelled out in a symbolic (and perhaps poetic) way how the chapters were really part of a cohesive whole. The re-edit did require some other changes. After ordering the pieces chronologically, I edited out any repetitive information. For example, I had to make sure that any person mentioned in the book was introduced only once. A number of the essays mention my husband’s mother, Judith, and in the original pieces she was introduced and described each time. I had to take some of that out. I also had to make sure that the timing of each essay made sense as a chronological narrative chapter – I wouldn’t want to mention my forty-eigth birthday in a chapter that appeared before “Forty-Six,” for example, which is about what happened on my forty-sixth birthday. For the most part the chapters are in actual chronological order, so that wasn’t a problem, but in one or two cases I had to edit out information that would have been confusing to the reader time-wise. I also had to introduce the move from Colorado to Boston early in the book, so I used the essay “Walden, Revisited,” which talks about my connection to Boston and return there, to do that. It took some careful re-reading to get it all right, but by the end I felt so much happier with the manuscript that I wished I had never sent out the original. In the meantime, however, the forward-thinking editor at Buddhapuss Ink, MaryChris Bradley, a 30-year veteran of the publishing industry, had already decided that she loved my manuscript and wanted to publish it. She was going to suggest similar changes, but she had so much faith in the future of my book that she was ready to sign it even before seeing the final, more chronological manuscript. The end result is a book we both love, and that I hope readers will enjoy. I still love the individual essay form. 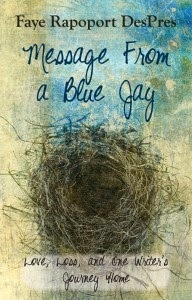 At the same time, I’m happy with the way Message from a Blue Jay will be published, as a memoir-in-essays. What I have, in the end, is a book I’m truly proud of: a nod to the personal essay and to memoir all at once. Tomorrow, Faye's Virtual Book Tour takes her to Mariam Kobras's blog. Her publisher is offering a personalized, signed copy of Message from a Blue Jay (plus swag) to one winner of their Virtual Tour Giveaway. Simply comment below to enter. For more chances, visit the Buddhapuss Ink or Message from a Blue Jay Facebook pages and click the Giveaway Tab! You can follow Faye on Twitter and connect on her book's Facebook page. Very helpful to hear from someone who has done this so successfully. I keep going back and forth between making my memoir a chaptered book or one of linked essays, many of which are already written and, like Faye's, written in different styles and voices. This post gives me much food for thought. Thanks Lisa and Faye! I'm glad the post was helpful, Susan! Congratulations, Faye, on your success. Your approach to memoir sounds fascinating. I'm glad to know things are working out so well with MaryChris and BuddhaPussInk... I'm soon to sign a contract with her myself. I wish you continued success with marketing and sales. It must be exciting! This is a great post, thank you! I love reading about writers' behind-the-scenes work and it's so good to know that there is hope for short pieces! Congrats, Susan Grier - out of all comments at all the blogs Faye visited on her book tour, your name was the winner of the book swag from her publisher!